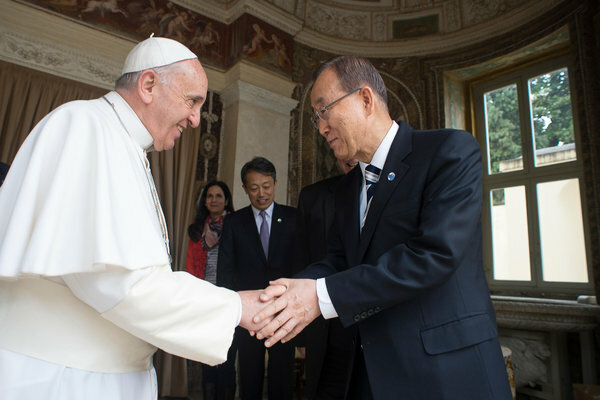 Will Pope’s Much-Anticipated Encyclical Be A Clarion Call On Climate Change? How will the world react to Pope Francis’s encyclical on climate change? The Sacrament of Creation: What Can We Expect from Pope Francis’s Ecological Encyclical? Will the Vatican Become a New Leader Against Climate Change? Pope Francis will visit New York City, Washington, D.C. and Philadelphia during September visit to U.S.
What Can a Popular Pope Do About Climate Change? Exploiting the earth “is our sin,” the pontiff says. With the official release of Pope Francis’s encyclical on the environment, it’s clear that several strains of thought prominent in the U.S. will be particularly challenged by the document. That includes U.S. individualists who tend to support limited government and fewer environmental restrictions — Rush Limbaugh has already accused Francis of Marxism — and also those who perceive a strong conflict between science and religion. The Pope’s entire case for caring for “our common home,” as he puts it, is moral. And the precise moral worldview being articulated — what might be called communitarianism, the idea that we’re all in it together, that “it takes a village” — deeply challenges an individualistic value system that research suggests is quite prevalent in the U.S. In several places in the text, indeed, the pope explicitly critiques “individualism” by name. “In the particular case of the United States of America, which does have a strong individualistic trend, we will be challenged by the Pope,” says Bill Patenaude, a Rhode Island based Catholic commentator who writes the blog Catholic Ecology. At the same time, the document also represents a mega-merger of religious faith and a vastness of carefully researched scientific information — challenging the conflict-focused way that so many Americans have been conditioned to think about the relationship between science and religion. In essence, then, the Pope rolls science and faith into a comprehensive statement about our global, common responsibility to address the planet’s vulnerability. Hofstede isn’t the only one making such observations. The Pew Research Center noted recently that “Americans’ emphasis on individualism and work ethic stands out in surveys of people around the world.” That’s not to say that every American is a rugged individualist — just that this way of thinking, and feeling, is more prominent here than in many other nations, according to researchers. There are many benefits to individualism, in the sense of how it drives people to strive to succeed, and allows them to choose their own paths and innovate in order to get there. In the context of the Pope’s encyclical, though, what matters is how such an outlook also helps to explain why we have such conflicts over collective environmental problems like climate change. For instance, numerous studies have found strong links between manifestations of individualism — such as free market beliefs and libertarian values — and the denial of global warming, or the perception that it isn’t a very serious problem. In the context of U.S. politics, we’re used to watching hierarch-individualists (Republicans) and egalitarian-communitarians (Democrats) clash along both moral axes. But the Pope is a different blend than we’re used to. “The Pope is hierarch communitarian,” says Kahan by e-mail. “No doubt about that.” In this analysis, Francis lies in the top right quadrant of the diagram above. Yes, he’s pro-life — but also an environmental activist. The communitarian side lies at the heart of the Pope’s current environmental endeavor, and his call to address a global, collective problem — warming. And to focus, in particular, on how it harms those who are most vulnerable. Disinterested concern for others, and the rejection of every form of self-centeredness and self-absorption, are essential if we truly wish to care for our brothers and sisters and for the natural environment. These attitudes also attune us to the moral imperative of assessing the impact of our every action and personal decision on the world around us. If we can overcome individualism, we will truly be able to develop a different lifestyle and bring about changes in society. So clearly, Francis is critiquing individualism — especially at its extremes. Science and Religion Conflict. At the same time, from the Scopes Trial to the stem cell saga, we are also a country that has traditionally seen major battles between science and religion — and has thus been conditioned to see them as being in conflict. It’s a perception that actually comes from two separate sides — from many religious believers but also from many atheists or non-believers. While perceptions of conflict are most centrally focused on the teaching of evolution, they extend throughout realms involving reproductive health and even into the environmental arena, where U.S. evangelicals tend to be considerably less accepting of climate change. Pope Francis is having none of that. Indeed, the encyclical contains a grand statement about the necessarily complementary relationship between science and faith. “Science and religion, with their distinctive approaches to understanding reality, can enter into an intense dialogue fruitful for both,” Francis writes. Francis’s encyclical lives up to that merged identity — much in the way Pope Francis himself does, with his chemistry background. For instance, Francis doesn’t just say humans are causing global warming. He enumerates the greenhouse gases much as a chemist might: “carbon dioxide, methane, nitrogen oxides and others.” And he also lists numerous non-human or natural factors that influence the climate — “volcanic activity, variations in the earth’s orbit and axis, the solar cycle” — before finally reiterating that it’s mostly human caused. So if you’re one of those who insists that science and religion are in conflict — or one of those who stokes that conflict — Francis presents a major challenge. And it’s worth noting that while it isn’t central to this encyclical, Francis has also spoken up in the past in favor of the Big Bang and evolution, two major scientific concepts that have met with considerable religious-driven resistance in the U.S. So in sum, here we have a leader of one of the world’s dominant churches articulating — and soon, coming to the U.S. to further articulate — a vision in which science and faith are partners in a communal quest to protect the vulnerable from the rampant profit motive and exploitation of the Earth. For U.S. individualists and science-religion battlers, that is going to be serious cause for contemplation — which, perhaps most of all, is what Francis’s encyclical is asking us for. Jorge Bergoglio mostra que é Francisco iniciando sua encíclica com o santo de quem emprestou o nome. Laudato Sii (ou, em português, Louvado Seja) teve o conteúdo antecipado nesta segunda-feira, 15, pela revista italiana L’Espresso – em uma última versão antes da revisão final. A encíclica é considerada a primeira, de fato, de autoria de Francisco – já que a Lumen Fidei, de julho de 2013, havia sido iniciada por Bento XVI. Conforme especialistas já apostavam, o documento é voltado à importância dos cuidados com o meio ambiente. Ele traz no capítulo Diálogo sobre o Ambiente na Política Internacional um apelo do papa. Ele diz que acordos internacionais são urgentes para “estabelecer percursos negociados a fim de evitar catástrofes locais que acabam por prejudicar a todos”. “O mais importante é que o papa foi bastante radical na denúncia das desigualdades econômicas e das injustiças sociais associadas à degradação do meio ambiente”, pontua o biólogo e sociólogo Francisco Borba Ribeiro Neto, coordenador do Núcleo Fé e Cultura da Pontifícia Universidade Católica de São Paulo (PUC-SP) – e professor, durante 20 anos, de Ecologia na PUC de Campinas. Esta é a 298.º encíclica da história da Igreja Católica – e a primeira que traz a ecologia como ponto central. Oficialmente, o Vaticano vai divulgar o documento na quinta-feira. Francisco teve muitos consultores para escrever a carta. Dentre os brasileiros, teriam sido ouvidos o teólogo Leonardo Boff, além de d. Erwin Kläutler, bispo da prelazia do Xingu. “O fato é que a encíclica chega num momento complexo para a defesa do meio ambiente em todo o planeta. Apesar do otimismo gerado pela Eco-92, pelo Protocolo de Kyoto (1997) sobre a redução da emissão dos gases responsáveis pelo efeito estufa e pelos Objetivos do Desenvolvimento do Milênio das Nações Unidas (2000), os primeiros 15 anos deste século viram um aumento da degradação ambiental e o sacrifício das agendas conservacionistas em função do crescimento econômico”, complementa o biólogo. “Por outro lado, também cresceu a frequência dos desastres naturais por causas climáticas, como furacões, secas prolongadas, invernos muito frios e enchentes, levando várias lideranças mundiais a se declararem comprometidas com a questão ambiental e dispostas a mudar a escrita recente na Conferência de Paris sobre o Clima (COP21) neste ano.” Por fim, Borba diz que a encíclica deve retomar uma das principais críticas ao Protocolo de Kyoto: “A de que as nações ‘em desenvolvimento’ estariam desobrigadas de esforços para reduzir as emissões de gases para não reduzir seu crescimento econômico”. Citações. Outro aspecto relevante do documento escrito por Francisco está nas notas de rodapé. Entre as 172 citações há a presença de outrora persona non grata na Igreja, como o jesuíta, teólogo, filósofo e paleontólogo francês Pierre Teilhard de Chardin (1881-1955), que defendia a integração entre ciência e tecnologia. “É revolucionária a menção dele em uma encíclica”, diz Altemeyer Júnior. Reuters. 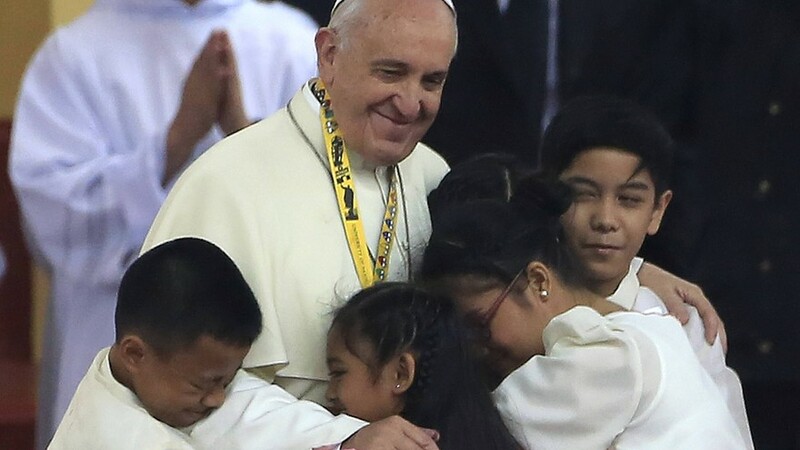 Pope Francis hugs children during a meeting at the University of Santo Tomas in Manila. Mark your calendar: June 18. That’s launch day for Pope Francis’s historic anticapitalist revolution, a multitargeted global revolution against out-of-control free-market capitalism driven by consumerism, against destruction of the planet’s environment, climate and natural resources for personal profits and against the greediest science deniers. Translated bluntly, stripped of all the euphemisms and his charm, that will be the loud-and-clear message of Pope Francis’ historic encyclical coming on June 18. Pope Francis has a grand mission here on Earth, and he gives no quarter, hammering home a very simple message with no wiggle room for compromise of his principles: ‘If we destroy God’s Creation, it will destroy us,” our human civilization here on Planet Earth. Yes, he’s blunt, tough, he is a revolutionary. And on June 18 Pope Francis’s call-to-arms will be broadcast loud, clear and worldwide. Not just to 1.2 billion Catholics, but heard by seven billion humans all across the planet. And, yes, many will oppose him, be enraged to hear the message, because it is a call-to-arms, like Paul Revere’s ride, inspiring billions to join a people’s revolution. Yes, our upbeat, ever-smiling Pope Francis. As a former boxer, he loves a good match. And he’s going to get one. He is encouraging rebellion against super-rich capitalists, against fossil-fuel power-players, conservative politicians and the 67 billionaires who already own more than half the assets of the planet. That’s the biggest reason Pope Francis is scaring the hell out of the GOP, Big Oil, the Koch Empire, Massey Coal, every other fossil-fuel billionaire and more than a hundred million climate-denying capitalists and conservatives. Their biggest fear: They’re deeply afraid the pope has started the ball rolling and they can’t stop it. They had hoped the pope would just go away. But he is not going away. And after June 18 his power will only accelerate, as his revolutionary encyclical will challenge everything on the GOP’s free-market capitalist agenda, exposing every one of the anti-environment, antipoor, antiscience, obstructionist policies in the conservative agenda. Just watch the conservative media explode with intense anger after June 18, screaming bloody murder, viciously attacking the pope on moral, scientific, economic and political grounds, anything. But most of all, remember, under all their anger, the pope’s opponents really are living in fear of what’s coming next. What’s dead ahead. “Nurturing and cherishing Creation is a command God gives not only at the beginning of history, but to each of us. It is part of his plan; it means causing the world to grow responsibly, transforming it so that it may be a garden, a habitable place for everyone.” Everyone. Pope Francis warns that capitalism is the “root cause” of all the world’s problems: “As long as the problems of the poor are not radically resolved by rejecting the absolute autonomy of markets and financial speculation and by attacking the structural causes of inequality, no solution will be found for the world’s problems or, for that matter, to any problems,” as environmental damage does trickle down most on the world’s poor. Imagine Pope Francis addressing a hostile GOP controlled joint session of the U.S. Congress in September. There’s no chance of changing the minds of those hard-right politicians, all heavily dependent on fossil-fuel special-interest donations. But he’s clearly laying the groundwork for a global revolution, and his enemies know it. Bottom line: Given the global reach of his encyclical, Pope Francis’ revolution will accelerate. So the GOP’s 169 climate deniers, Big Oil, the Koch Empire and all hard-right conservatives better be prepared for a powerful backlash to their resistance. Pope Francis’s 2015 war cry is to lead a global anticapitalist revolution, a revolution leading billions to take back their planet from a fossil-fuel industry that’s lost its moral compass to the “golden calf” and is destroying its own civilization on Planet Earth. The pontiff plans to issue a rare and controversial plea for Catholics to consider the environment. Recent polls show his message just might resonate. Pope Francis has ambitious environmental plans for 2015. Come March, he will deliver a 50 to 60-page edict urging his 1.2 billion Catholic followers to take action against climate change. 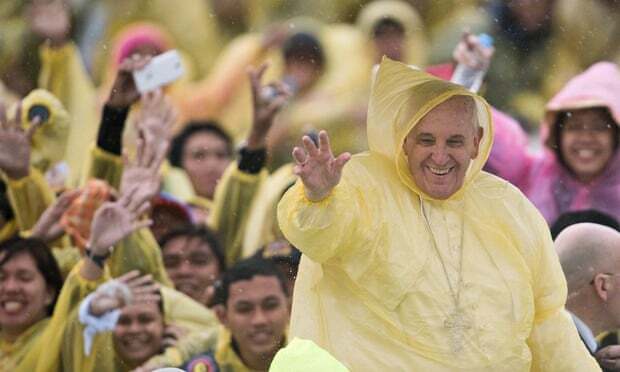 The Pontiff will make his announcement during his visit to the Philippine city of Tacloban, which was ravaged by typhoon Haiyan, which killed thousands in 2013. But within his global congregation, many conservative Catholics are expected to oppose the pope’s environmental views. The message comes months in advance of the next United Nations climate meeting, which is slated to begin November 2015 in Paris. The pope’s lead scientific adviser Bishop Marcelo Sorondo, said that the pope’s message to his bishops, called an encyclical, is supposed to influence world leaders as they make their final recommendations after 20 years of negotiating how to reduce global carbon emissions, The Guardian reported. “The idea is to convene a meeting with leaders of the main religions to make all people aware of the state of our climate,” Sorondo said to Cafod, the Catholic development agency, of the pope’s plans. Francis has previously pointed to the environment as being “one of the greatest challenges of our time,” and he says that Catholics have a moral and scientific obligation to protect it. But the move to publish an encyclical goes beyond offering a soundbite. “A papal encyclical is rare. It is among the highest levels of a pope’s authority,” Dan Misleh, director of the Catholic climate covenant, said to The Guardian. The pope will distribute the lengthy document to 5,000 Catholic bishops and 400,000 priests, who will then share the message with their congregations in churches across the world. In the United States, where climate change is a controversial topic, the majority of Catholics agree that the Earth is getting warmer, about a third of that group did not believe that the change is due to human activity, according to a 2012 survey by the Public Religion Research Institute. The same poll found that about 82 percent of Republicans doubt that humans cause climate change. Among the climate deniers include some influential Republicans like House Speaker John Boehner. Globally only 11 percent of people see the pope unfavorably, and 60 percent approve of him, according to a 2014 poll by the Pew Research Center. Pope Francis is overwhelmingly accepted by heavily Catholic countries: 84 in percent Europe; 78 percent in the U.S., and 72 percent in Latin America. Now, with the pope’s environmental encyclical forthcoming, and his global support at astronomical levels, it’s still uncertain how much influence his environmental push will have with the most devout deniers of climate change. Last week it was reported that Pope Francis had formally recognised the International Association of Exorcists, a group of 250 priests spread across 30 countries who supposedly cast out demons. The head of the association, Rev Francesco Bamonte, announced that this was a cause for joy because, “Exorcism is a form of charity that benefits those who suffer.” While Pope Francis, who frequently mentions Satan, no doubt agrees with this sentiment, this granting of legal recognition to the concepts of possession and exorcism has come as something of a shock to those who do not share this world view. Belief in possession is widespread both geographically and historically and is far from rare in modern western societies. A YouGov poll of 1,000 US adults last year found that over half of the respondents endorsed belief in possession and 20% remained unsure. Only 11% said categorically that they did not believe people could be “possessed by the devil”. Is it possible that the pope is right and demons can sometimes take control of their victims’ behaviour? Are exorcists really bravely battling against the most powerful, evil forces imaginable? Or are possession and exorcism best explained in terms of psychological factors without any need to postulate the existence of incorporeal spiritual entities? I would argue that the available evidence strongly supports the latter interpretation. There can be no doubt that some forms of behaviour that would once have been seen as evidence for possession by demons or evil spirits would now be recognised as being caused by neuropathology. Hippocrates, in The Sacred Disease, declared that epileptic convulsions were caused by brain malfunction, not evil spirits. Belief in possession was still widespread some 400 years later, however, when Jesus encountered an individual believed to be possessed but who was, in fact, clearly suffering from epilepsy. Another condition that would often have been interpreted in a similar manner is Tourette’s syndrome. Interestingly, the first recorded description of a case of Tourette’s may be in Malleus Maleficarum (or Witch’s Hammer) published in the 15th century by Jakob Sprenger and Heinrich Kraemer. This notorious book served as a guide for identifying witches and the possessed and included a description of a priest whose tics were thought to be a result of possession by the devil. Although the symptom that people most readily associate with Tourette’s syndrome is vocal outbursts of foul language, this symptom is in fact quite rare, affecting only around 10% of sufferers. Having said that, this is probably the main symptom that, in times gone by, would have led to suspicion of possession. There are several other neuropathologies (eg certain forms of schizophrenia) that might also have been interpreted as possession in less enlightened times (and sadly sometimes still are) but it is not plausible to explain all cases of apparent possession in neuropathological terms. It should also be borne in mind that the type of phenomenon that would be the main focus for the International Association of Exorcists is but one example of situations where an individual appears to have been taken over by some agent, resulting in a dramatic change in behaviour, mannerisms, voice and even, allegedly, memories. Other examples would include mediums “channelling” communications from the dead; shamans inviting possession by the gods, ancestors or animal spirits; individuals apparently reliving past-lives, having gone through a process of hypnotic regression; and volunteers during hypnosis stage shows apparently taking on the identities of celebrities, animals or even aliens. The controversial diagnosis of dissociative identity disorder (formerly known as multiple personality disorder) is yet another example of this phenomenon, though many commentators, myself included, believe that it is not in fact a genuine psychiatric disorder but is instead a product of dubious forms of therapy. The sociocognitive approach, as outlined by Nick Spanos in his posthumously published book, Multiple Identities and False Memories, has the potential to explain all the phenomena listed in the previous two paragraphs without the need to invoke disembodied spiritual entities. Essentially, this approach argues that all of these phenomena reflect learned patterns of behaviour that constitute particular recognised roles within specific cultural contexts. Although it may not always be immediately obvious, there are often benefits to enacting the role of being possessed. Indeed, in many societies, certain forms of possession are welcomed. For example, glossolalia, or “speaking in tongues”, is encouraged in many western Christian societies and is interpreted as possession by the Holy Spirit. During glossolalia, the individual produces vocalisations of meaningless syllables. Although these may sound superficially like a foreign language, analysis shows them to have no true linguistic structure whatsoever. Glossolalia can sometimes involve dramatic behaviour such as convulsions, sweating and rolling eyes but can also be much more subdued. The actual form the glossolalia takes is entirely determined by the expectations of the particular religious community involved. For less positive forms of possession, the benefits of taking on this role may be harder to identify but they still exist. As Michael Cuneo describes in his excellent book, American Exorcism, the phenomena of alleged possession and exorcism are much more widespread in the US than is officially recognised. For many people, the idea that all of their previous socially and morally unacceptable behaviour was not in fact their fault but due to possession by demons is appealing. Furthermore, once those demons have been exorcised, the repentant sinner is now welcomed back into the loving arms of his or her community. Anthropologists have pointed out that in some cultures, those with little or no social influence can let off steam and vent their true feelings towards the more powerful members of their society while “possessed” without having to face any repercussions. They are not held to be responsible for their actions, the possessing spirit is. It is notable that historically in Europe, it was women who were much more likely to be “possessed” than men. Of course, we must not forget that the outcome for the person who is labelled as “possessed” can sometimes be far from positive. To give one notorious example, the parents of 23-year-old Anneliese Michel and two West German priests were convicted in 1978 of causing her death (they received suspended sentences). They had starved the young epileptic as part of a horrendous 11-month exorcism. She weighed just 68 pounds (5 stone or 30 kilograms) at the time of her death. The Guardian has noted that belief in possession has been a factor in several child abuse cases in the UK, including the tragic death of Victoria Climbié in 2000. The official recognition of such pre-Enlightenment beliefs by the Vatican will do nothing to prevent future tragedies of this kind.